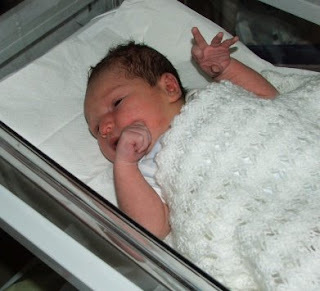 I had so many nice comments and emails over my post about baby Joseph, that I thought indulgent or not, you might like to know about his first trip afloat. Here he is at 16 days old, kitted out in his new life jacket aboard the yacht club launch on his way up the Hamble River to our yacht Greta. Completely unfazed by the motion or the new surroundings, he settled into a peaceful sleep until it was time for a feed. Similarly undisturbed by the trip back to the club, he was the star attraction in the bar. For those of us with a wooden mast the annual ritual of touching up the varnish means either dropping the mast or working aloft from the bosun's chair, while trying not to spill varnish on the deck or on the crew below. If you have read my winter posts you will know I take Greta's spars home for winter. 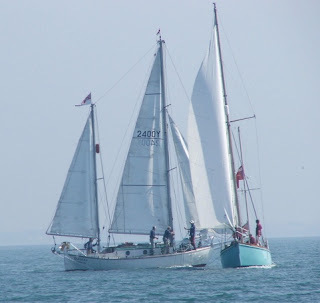 The crew of pilot cutter Annabel J have found another, interesting, alternative, if your boat is big enough why not erect scaffolding around the mast, painting, maintenance couldn't be easier. 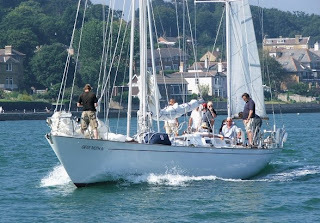 Annabel J is based on a Bristol Pilot Cutter, built in steel in the mid 90's, she is 54'10" LOD and 66'3" LOA. Read about her interesting history. 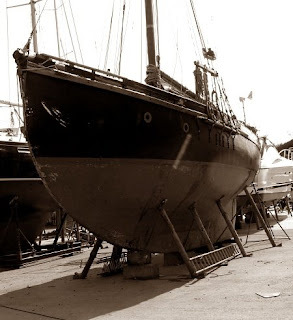 Well today's the day, and inspired by Adam at Messing About in Sailboats, we wandered down to the Elephant Boatyard, where Suhaili - RKJ's ketch has been lying ashore, to celebrate the day and show young Joseph a piece of yachting history. What a surprise then to find that she was gone, launched on Monday, presumably in order to attend a 40th anniversary event elsewhere. Oh well, it's only a short walk back up the hill, to a celebratory lunch of frankfurters, corned beef and baked beans. Congratulations Sir Robin, you've been an inspiration to many of us for the past 40 years. Organised on behalf of the Hamble Sea Scouts, this years Hamble River Raid will take place on Saturday 9th May. Starting from the hard in Hamble village at around 11.00AM, the boat crews will row a course up river to Bursledon and back. 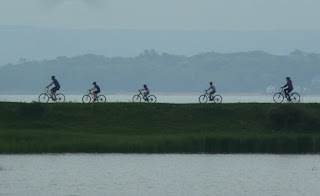 In addition there will be sprint race heats in front of the town quay. 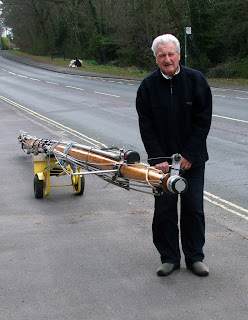 Racing will focus on the Bursledon Gig, a traditional fixed seat rowing boat, a fiberglass version of which had been reintroduced onto the river in the last few years. Ashore there will be entertainment a beer tent and hog roast. Look forward to seeing you there. It seems incredible that only a few weeks ago hail stones were falling so hard they were piling up in the cockpit as I passed this magnificent yacht, just arrived in the river. We exchanged a brief wave, both intent on getting to where we were going and getting out of the horrid weather. 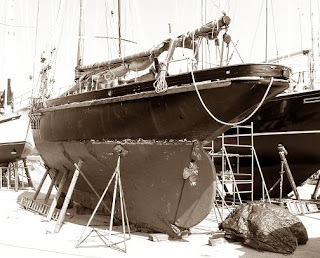 Now hauled out in a local boatyard, I managed to catch up with the owner at the weekend, in the warm spring sunshine and find out a bit more about this impressive boat. At first glance she looks like a working boat, indeed the bows and forefoot have the look of a Quay Punt. 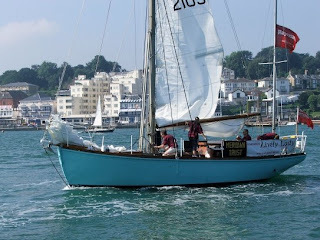 I understand the boat was built in Falmouth in 1909 by a builder of Quay Punts , however the counter stern marks her as a yacht, which was confirmed by the owner. She's ashore celebrating her 100th year awaiting a new engine (the old one is hidden under the tarp by the rudder). While the engine is out, the bilges will be cleaned and painted. Please excuse the sepia tint photos, I know it's corny, but seemed somehow appropriate. 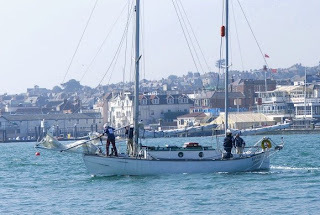 With April 22nd rushing up on us and the appeal by Adam T on Messing About in Sailboats for fellow bloggers to make the 22nd "Robin Knox-Johnston day on the web" to celebrate Sir Robin's success in the Golden Globe race, I dug out these photo's taken back in 2005. We were fortunate to be in Cowes mid week enjoying fantastic August weather. 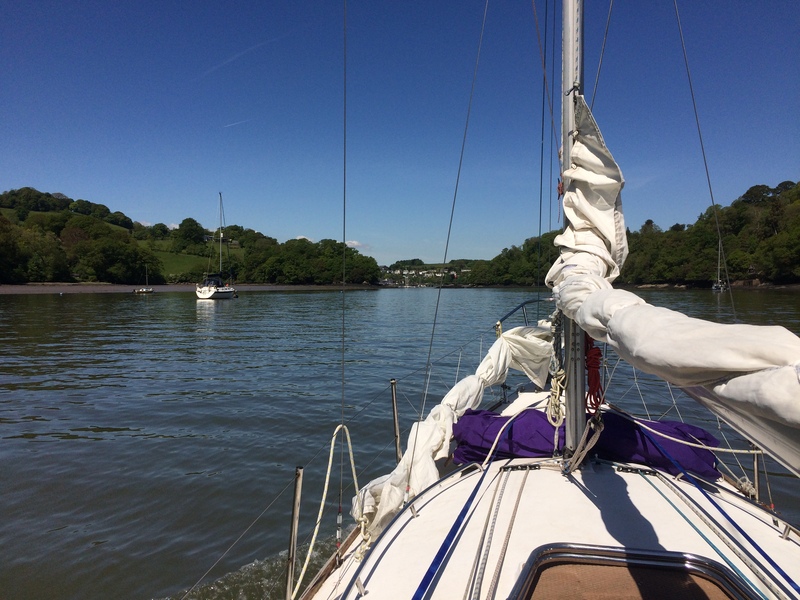 Coming down river in the dinghy, we had spotted the newly restored Gypsy Moth alongside at the UK Sailing Association base. Our curiosity was rewarded when we were invited aboard Gypsy Moth and leaned of the race to be held on the following morning. We got up early and took station outside Cowes in time to see an illustrious fleet out for the start of a remarkable race. 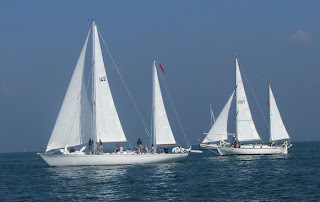 Three famous contemporaries from what many would describe as the golden days of offshore sailing Suhail, Gypsy Moth IV and Lively Lady, met in Cowes roads to race each other. As a child growing up in the 60's, these yachts were the stuff of legend, as were the intrepid yachtsmen who sailed in them Robin Knox-Johnston, Francis Chichester and Alec Rose. All famous single handed sailors of the day, all sailed the globe alone and all subsequently received knighthoods in honour of their achievements. To see them all together was fantastic. I don't know if Sir Robin was aboard, there was a really strong tide and we were making our way east towards Chichester so we didn't get close enough to see the crew. That said it was a marvellous sight. 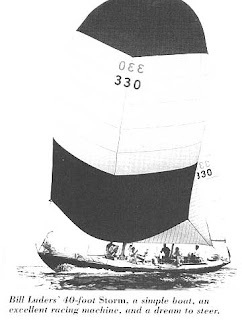 Following my post about what defines a Yawl, I was delighted to hear from yacht designer Ted Brewer most especially his first hand experience sailing Bill Luders aboard Storm. I agree with you that the "yawl" term is misused. 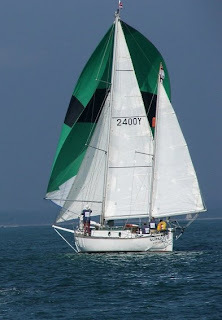 To my mind a yawl is a yacht with the mizzen mast stepped well aft and the mizzen itself a relatively small percentage of the over all sail area, certainly less than 15%. Another misused term is "cutter" and today people use the term to describe any boat with a double headsail rig and a bowsprit. That could describe a Friendship sloop, of course. To them I say, go to my web site http://www.tedbrewer.com/ and look at the Blue Jeans. No bowsprit, but she is definitely a cutter because of mast location and the size of the foretriangle in relation to the mainsail. I would like to correct some errors in your writeup about Bill Luders' Storm. She was 39 feet LOA, not 43 feet. Also, when we put the ketch rig on her we did have a mainsail. She was rated with that dinghy sized main, which we never set, but she was a legitimate ketch. The CCA rule said that any sail tacked forward of the mast was a headsail. So we put an eye bolt about 6 inches forward of the mast and tacked a working jib from it. 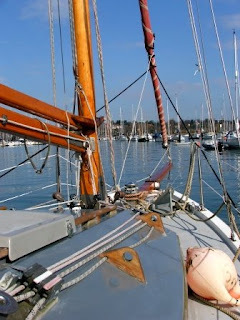 The luff of the jib was hoisted by the main halyard and was passed abaft the mast and the spreader, In effect, we set a good sized loose footed "main" sail but were only rated for the 60 sq ft dinghy sail. Actually that sail came off a Frostbite dinghy so was quite a bit smaller than a Laser main. I will say for Bill that he wrote the CCA rules committee in 1960 to say that these were loopholes that needed to be corrected. They did not believe anyone would be crazy enough to do it, so Bill worked out the idea and I drew it up. 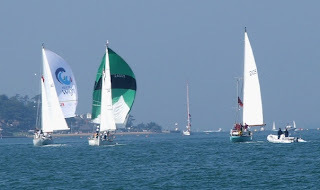 The CCA rules committee came out with minimum mainsail sizes the next year. And, another time, Bill came up with a genoa jib with a roach as big as a mainsail, held out by large battens. That was also ruled out the next year. I worked for Bill and sailed aboard Storm for 6-1/2 great years, 1960-1967, and we won more than our share of silver, no matter what rig Storm wore. She was a great boat and Bill Luders was a great man and a great boss. I got to know Ted through his book Understanding Boat Design when I was trying to make sense of the "lead" of the sail plan on a cutter I owned a few years ago. His book is a must read for anyone who wants to make sense of how yachts actually work. Ted is also a contributor to US magazine Good Old Boat providing the sort of designer's insight which is sadly lacking in many UK yachting magazines. 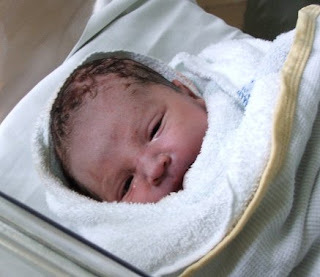 Apologies for the completely self indulgent post, but our new addition arrived yesterday and lots of people, have who can't get to visit have been asking to see him. 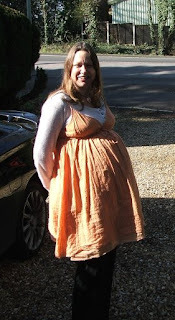 Here's his mum just a few days ago. We'd both like the give our sincere thanks to everyone at Southampton Labour Ward, they were just brilliant. He finally arrived at tea time on Good Friday. Weighing in at an incredible 9lb 6oz, he's fit and well as is mum. Finally here he is still not a day old and enjoying all the attention. This seemed like an appropriate story for the Easter wekend. I needed a hand while stepping the mizzen mast the other day, so walked along the pontoon and asked one of the other boats owners if he would would mind helping out, by holding the mast steady, while I attached the shrouds. The mizzen is only the size of a large dingy mast, but a helping hand makes all the difference. 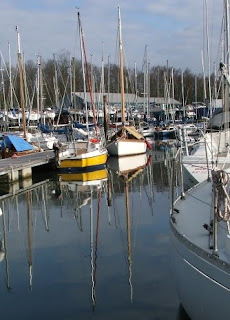 The owner of this little yellow sloop was happy to help out and as boat owners do, we got chatting. 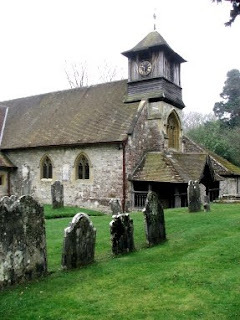 Turns out he is the vicar of the local church St Leonards in Bursledon the delightful building (below) in Bursledon dates back to the 12th century. Who's hidden the aircraft carrier? I had a day off work on Friday, so we drove down the Solent for a late breakfast. 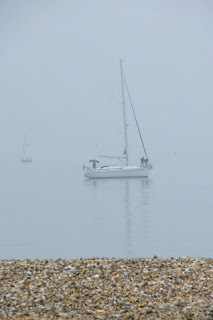 The morning visibility was very poor, as these two shots of nearby Hill Head show. Above Hill Head looking east towards Lee on Solent. 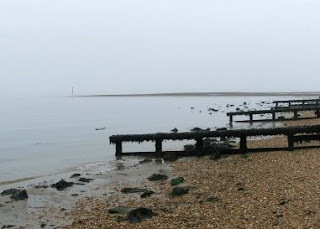 Below looking west towards Calshot. Arriving in Stokes Bay at one of our favourite beach front cafes, the viz was just as bad. The yacht below was anchored close inshore, the one in the background no more than 50 yards away. 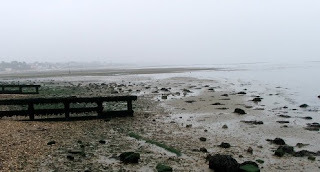 Normally you can see right across the Solent to Ryde on the Isle of Wight. The visibility was forecast to lift in the early afternoon, so planning on going for an afternoon sail, I checked all the local weather stations. One of them Ryde Web Cam, looks straight back into Stokes Bay where we had been having breakfast. We were a bit surprised to see this aircraft carrier, anchored in the Solent, mid way between Ryde and Stokes Bay. It had been completely invisible to us only a couple of hours before. I'm guessing it's the USS THEODORE ROOSEVELT presumably over as part of the security measures for the G20 last week. One of the good things about living close to the boatyard, is being able to take equipment off the boat and store it safely for the winter. Here's my father-in-law wheeling the main mast back to the boat. It's been in the garage since November, safe and dry. With four new coats of varnish as a "touch up" over winter, the spars are looking really nice (see post Winter Work). 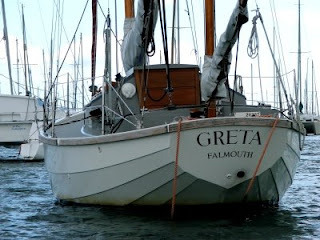 Greta is a Cornish Yawl, built by Cornish Crabbers she was in fact the prototype which was owned and fitted out by the designer Roger Dongray and exhibited at the Earls Court Boat show London in 1988. Over winter she's been ashore at a local boatyard where I replaced the cutlass bearing and repacked the stern gland along with the normal winter work of polishing and anti fouling. 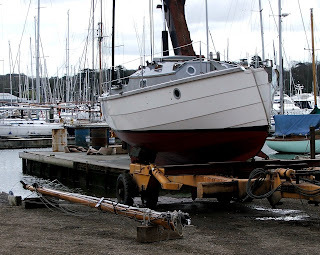 When we arrived with the mast, Greta was already on the slipway, there was a big spring tide and the yard was taking the opportunity to launch as many boats as possible ahead of the upcoming Easter weekend. Just as I was motoring her down the river to her berth there was an unexpected hailstorm and of course I had forgotten my wet weather gear. I got completely soaked. However the sun eventually came back out once she was safely on her mooring. 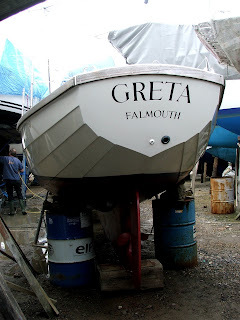 This is Greta at the end of last season, one of the really frustrating aspects of a counter stern is the water splashing over the boot line staining her otherwise gleaming topsides. This year I'm going to make much more of an effort to keep her well scrubbed. But then again I might just go sailing!! !